Over the last few years mineral makeup has become extremely popular, probably due to the excitement over its many benefits. Most major cosmetic companies have issued a series of mineral foundations, blushes, concealers, eye shadows and other makeup items. The difference between mineral makeup and classic make up lies in the fact that mineral make up, much like its name says this is made of sterilized and pulverized minerals. This mineral base is combined then with inorganic pigments of color creating a vast color spectrum in which every woman can find her own type. Mineral makeup is non-comedogenic, which means it does not clog the pores. This is important since many skin issues start with blocked pores. They collect dirt and bacteria and may become an infection site causes acne and blackheads and leave unappealing scars. This kind of makeup allows the skin to breathe, which is particularly important for women with sensitive skin. Mineral makeup does not aggravate the existing problems with skin like dryness rosacea or acne like classic make up sometimes does. Mineral makeup is based on ingredients that are inorganic, which means that they do not provide a good environment for microorganisms to breed and eventually infest the skin. 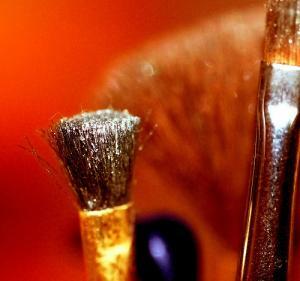 If it is applied properly, meaning with clean brushes and similar items, mineral makeup can be considered sterile. Another advantage of its inorganic nature is that it does not require preservatives. It has a long shelf life and, more importantly, does not irritate and damage the skin with chemicals that are used for preservation. High quality mineral makeup is much lighter for the skin that the normal, chemical-based makeup. It never gives a feeling of heaviness nor does it feel like a mask placed on the skin, suffocating it. Many women claim that wearing mineral makeup sometimes feels like they are not wearing any makeup at all, except that their healthy, smooth and radiant look proves them otherwise. The best mineral makeup products also contain ingredients that nourish and protect the skin like UV filters. They may also contain zinc, magnesium and similar beneficial minerals and some even contain some anti-inflammatory ingredients. Women with oily skin often have problems with their makeup as most of it is oil-based. With mineral makeup this is never the problem because it contains no oils whatsoever. High quality mineral makeup is usually very resistant and waterproof and women can even go to bed with their makeup on and wake up the next day looking fabulous. Mineral makeup provides a perfect cover for wrinkles fine likes and crow’s feet making the skin appear younger and fresher. Why is mineral makeup bad for my skin? Using Vaseline for face skin care - good or bad idea?